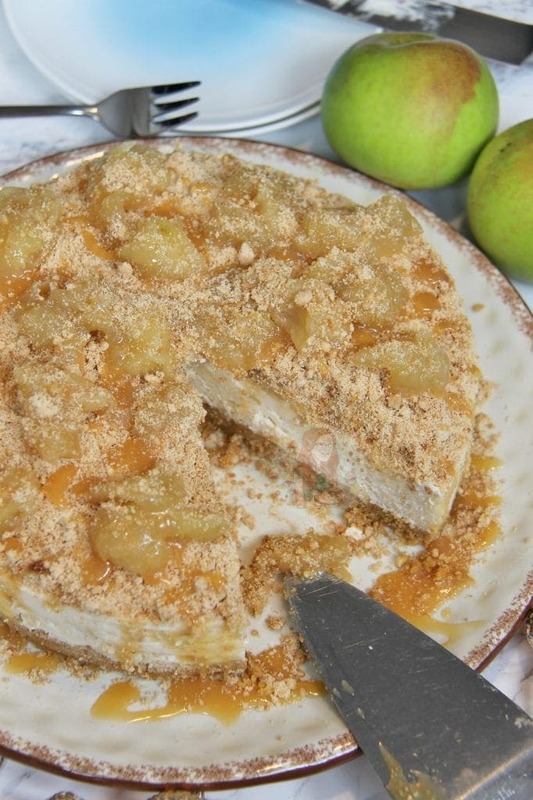 Buttery Biscuit Base, Vanilla Cinnamon Apple Crumble Cheesecake Filling, and even more Crumble Apple Goodness on top. Soooo sorry if you don’t like crumble, because as you can tell, I have gone a little crumble crazy recently. 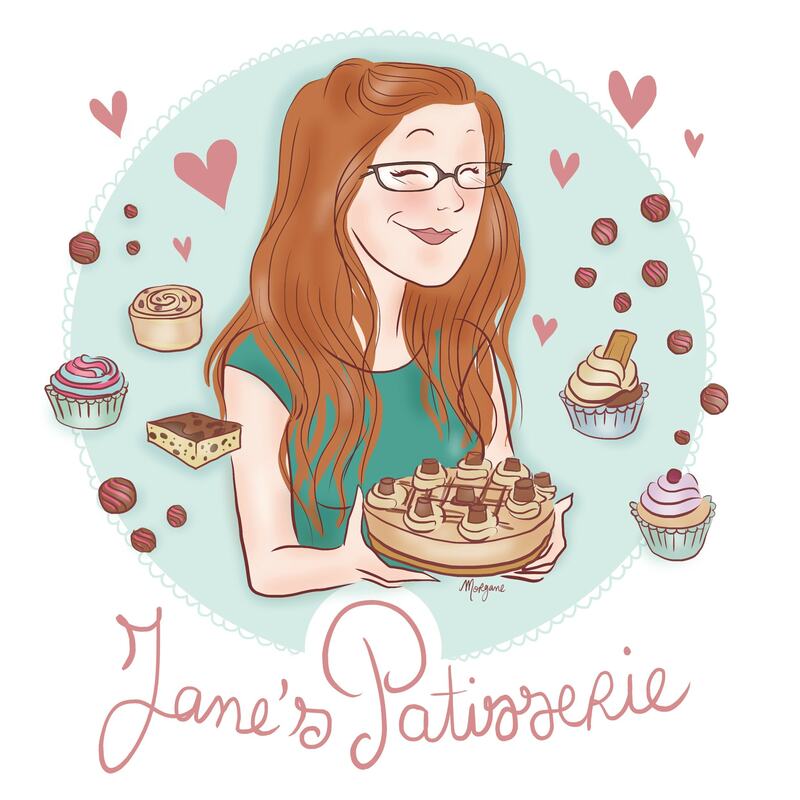 I have posted my Apple Crumble Cupcakes and my Apple Blackberry Crumble Pie only recently, and I was just craving more! 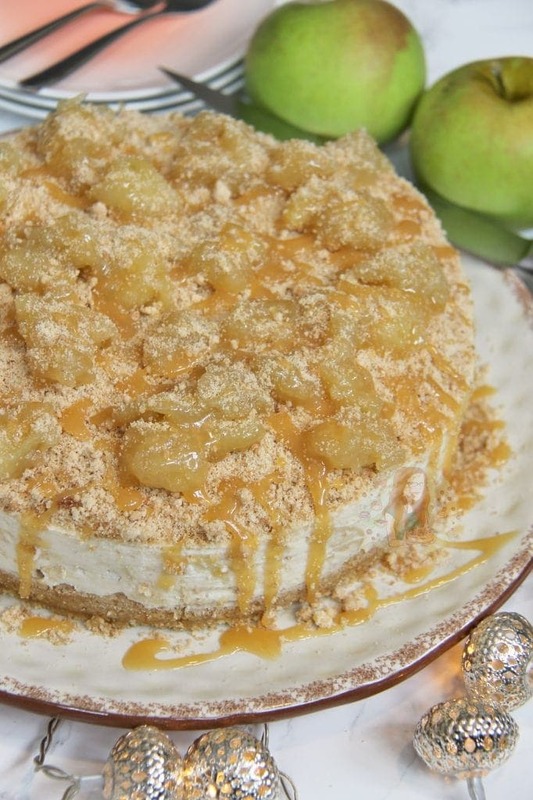 However, this time I thought I would merge the delicious idea of an apple crumble… into CHEESECAKE form! Honestly, so good. 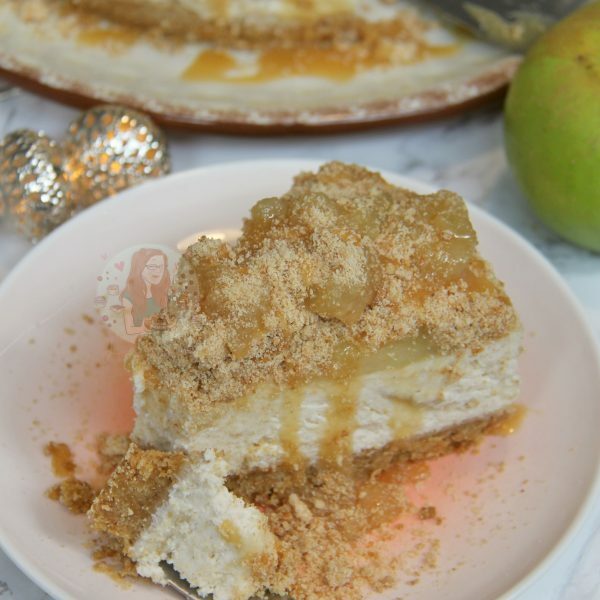 I can’t technically call this a no-bake cheesecake, as you have to cook the apple, and the crumble part of the cheesecake… but the rest is a no-bake style. 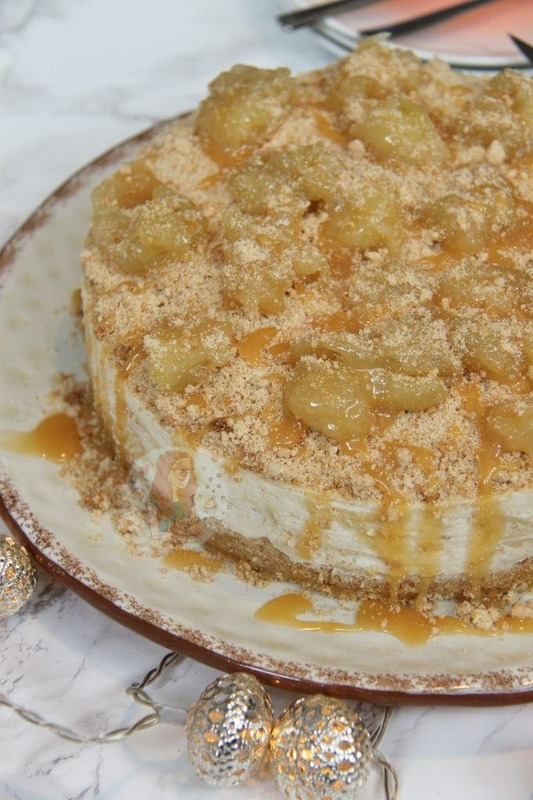 I have seen many recipes for a baked apple crumble cheesecake, kind of like my Apple Crumble Cake where the apple is just baked with the rest of it. The problem for me with this was that I felt like it could very easily go wrong. Also, I loved the idea of a lighter, creamier, sweeter cheesecake in comparison to a baked cheesecake filling. 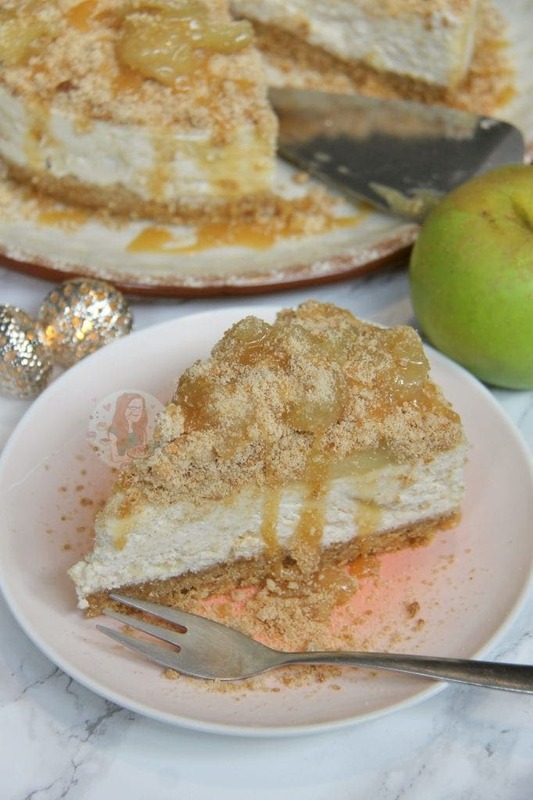 Baked cheesecakes can often be light and creamy as well, but with the apple, I thought the no-bake style was the best way to go. I decided to use Mascarpone for the main part of my cheesecake filling, as its naturally sweeter and delicious. Often when I make a no-bake vanilla cheesecake, I will use mascarpone as its less tart in comparison to Philadelphia and other Cream Cheeses. 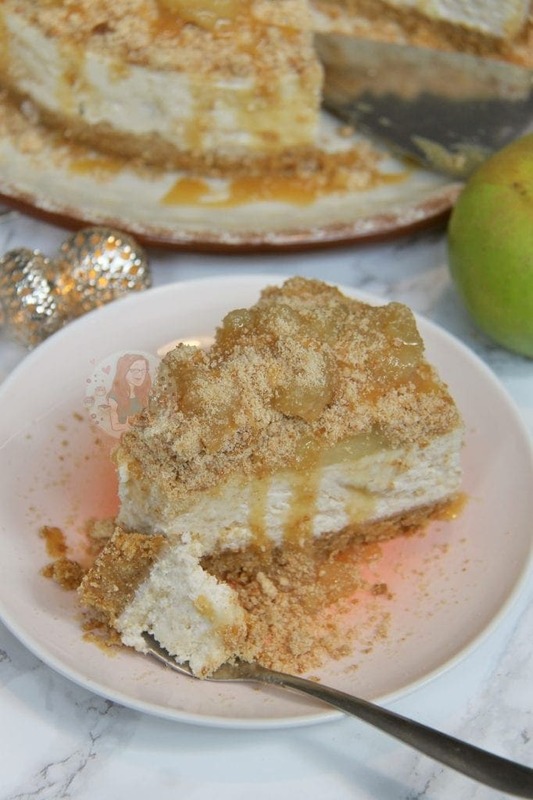 As the apple can often be quite tart in my mind, I thought it should be married with the mascarpone cheesecake filling and ohmydays it worked so utterly perfectly! To make it slightly more Apple Crumble style however, I did add in a little cinnamon. Yum. Make your crumble mixture by rubbing together the Sugar, Flour and Butter until the mixture resembles bread crumbs. 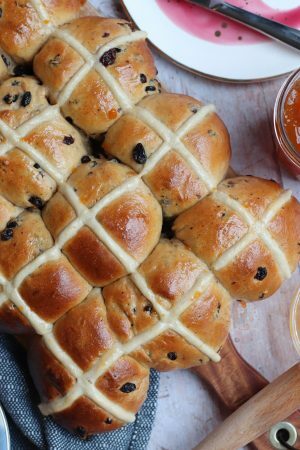 Spread the mixture onto a tray and bake in the oven at 180C Fan, for 15-20 minutes until its starting to brown. Once baked, let the mixture cool in a bowl. Chop your cooking apples into one inch size pieces and add to a heavy based saucepan. Sprinkle over the Light Brown Sugar, and add 2tbsps of water. On a low-medium heat, cook the mixture for 5 minutes whilst stirring. After the five minutes of stirring, let the mixture come to a simmer and cover with the lid of the pan – continue to cook for 4-5 minutes until the apple starts to soften down but still stays in pieces rather than becoming a mush. Strain the mixture of any excess liquid, and leave the mixture to cool fully. Once the crumble and apple mixtures are cool, make the base. Blitz the biscuits in a food processor (or smash up) to a fine crumb. Melt the butter, and add it to the biscuits. Pulse them again until combined well. Press down into the bottom of a 8″/20cm Deep Springform Tin and refrigerate for now. 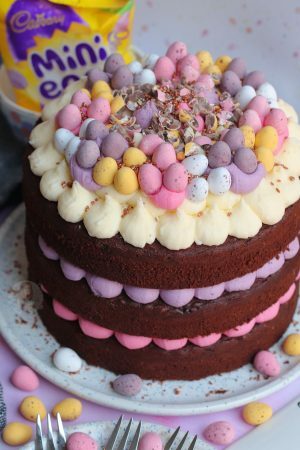 With a stand mixer, or a large bowl with a hand whisk, add the Mascarpone, Icing Sugar, Cinnamon and Vanilla. Whisk together until smooth and combined. Pour in the double cream, and whisk again till thick. Add in 2/3 of the apple mixture and fold together carefully. It may look a little funny in places, so be careful but thorough. Spread the mixture onto the biscuit base. Add 3/4 of the crumble mixture on top, and leave the cheesecake to set in the fridge for 5-6 hours, or preferably overnight. Once set, remove from the tin carefully. 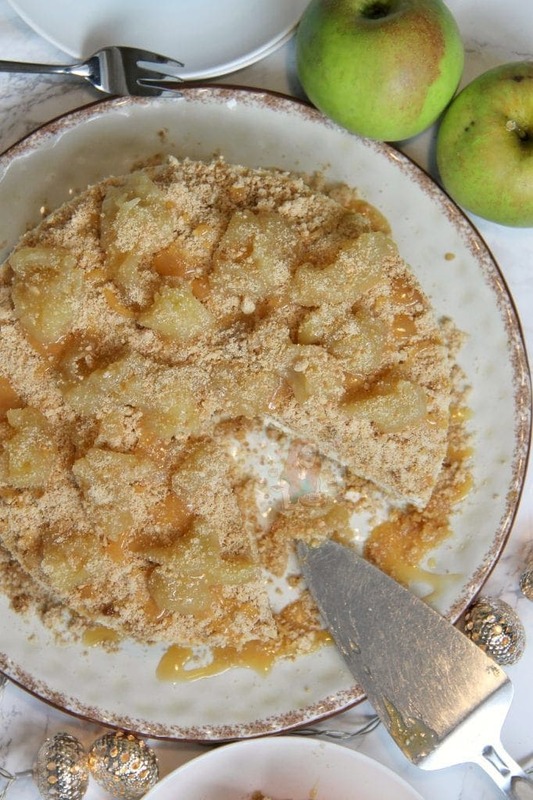 Add on any spare apple on top, and sprinkle on a little more crumble (for decoration and texture) and even drizzle with some Caramel or Toffee sauce! Enjoy! I recommend using a 8″/20cm Deep Springform Tin. I used Cooking/Baking apples in this recipe – this is quite important as regular eating apples are a lot softer and will just turn to mush. You don’t have to use sugar to cook the apples either, but I think it makes a delicious flavour! You can use Philadelphia, or other cream cheeses in this recipe, but they must be full fat. As the cheesecake mixture itself is a simple Vanilla and Cinnamon recipe, I must prefer using mascarpone as its naturally a bit sweeter, which competes well with the tartness of the apple. You can easily use a packet mixture of the crumble mix, but you still need to bake it in the oven first before adding to the cheesecake. This cheesecake will last for three days in the fridge. I’m afraid I have never tried, but as long as they’re drained so there isn’t any excess liquid I’m sure it would be fine?! 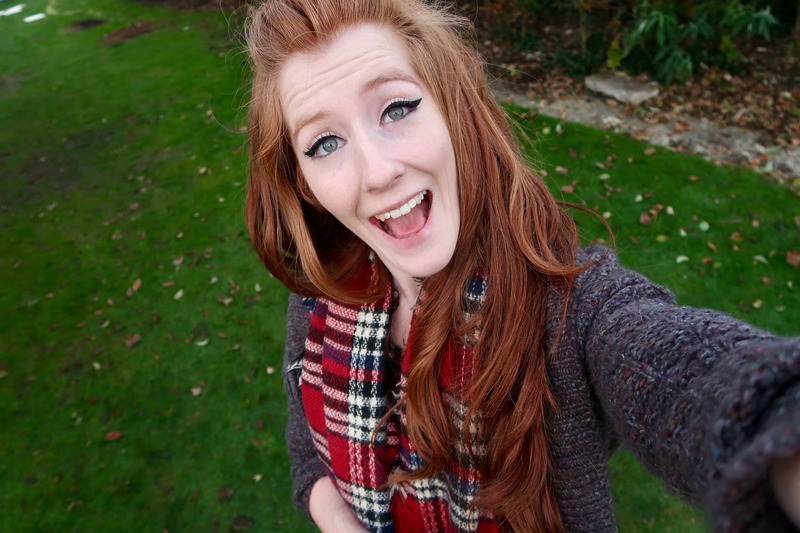 Hi Jane. I’m attempting your Apple crumble cheesecake Easter Sunday. I would like to use a 23cm tin. How much filling would you suggest I use? 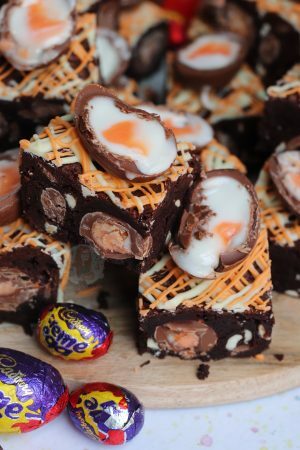 Oh my word this looks incredible! I was looking for an alternative desert to have on christmas day and think this is going to have to be it!! Thanks for the recipe. Hi Jayne. When doing the breadcrunbs, when getting them off the tray they turned into one sheet of breadcrumbs. I did them twice as I thought the first time maybe I flattened them on the tray too much but the second time was the same. Any thoughts? Maybe try a large tray so it spreads more, and it should break away easily. I literally just pour it onto a tray and bake the crumble and then pour it into a bowl. It might also be that your oven was too hot. Thanks. I did put it on a normal baking tray and spread it out. I put it on 170 and put it on 20 mins first time then 15 mins second time. Thanks 🙂 I’ll try that and maybe for less time. Aww I hope you loved the cupcakes!! And thank you so much! Looks delicious! I bet it tastes dreamy with the mascarpone cheese. Great photos. Oooh it definitely does! Thank you!